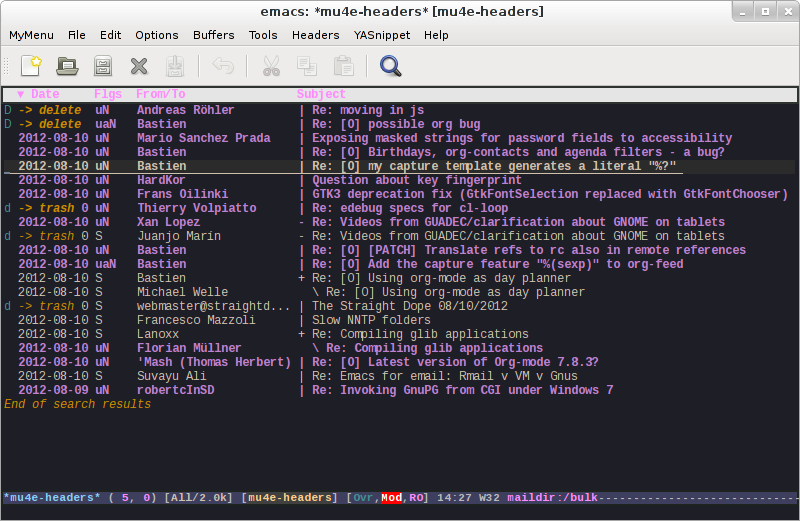 mu4e is an emacs-based email client. It is fully search-based, with a UI optimised for speed with quick key stroked for common actions. Emails can be composed with rich-text using org-mode. Email addresses auto-completion is supported. Actions are asynchronous, so heavy actions never block emacs. The basic idea is this: you configure an offline IMAP client to synchronise your remote email server with your local computer. Two possibilities for an IMAP synchroniser are mbsync and offlineimap. This post describes a setup using mbsync. Install SSL development files, required by mbsync for SSL authentication. With RPM based package managers, sudo yum install openssl-devel or if using dnf (e.g. with Fedora 22+), then run sudo dnf install openssl-devel. With debian machines, sudo apt-get install libssl-dev. Install mbsync, either from a release tarball or from git. Create a temporary file .mbsyncpass and store your plain text password in there. Next, gpg2 --output .mbsyncpass.gpg --symmetric .mbsyncpass. Move mysyncpass.gpg in ~/.emacs.d and remove the .mbsyncpass file. Generate the encrypted file with gpg2 --output ~/.authinfo.gpg --symmetric ~/.authinfo. Remove the ~/.authinfo file. PassCmd "gpg2 -q --for-your-eyes-only --no-tty -d ~/.emacs.d/.mbsyncpass.gpg"
Patterns "Sent Items" "INBOX" "Deleted Items"
Install mu4e, either using a package manager, from a tarball, or from git. Details here. Now set up your mu4e configuration. Check out the mu4e documentation on the variables. Make sure the following is stored in an .el file that is loaded by emacs, e.g. by the ~.emacs file. (setq mu4e-get-mail-command "mbsync -c ~/.emacs.d/.mbsyncrc work"
Now it’s time to try out mu4e. Open up emacs and type M-x mu4e. The complete list of mu4e key bindings is listed here. The more popular approach is offlineimap, and I tried this for a week. I later tried mbsync, and this is working much better for me. People have opted for offlineimap because of its ability to a invoke python file to prompt a user for a password, thus avoiding plain text passwords being stored locally. Fortunately, this has now been implemented in mbsync, which is what the PassCmd entry in .mbsyncrc is for. Zawinski’s Law “Every program attempts to expand until it can read mail. Those programs which cannot so expand are replaced by ones which can.” Law of Software Envelopment, Jamie Zawinski.